Kim Jeong-eun and Trump agreed to refresh North Korea–US relation and complete denuclearization at the summit on 12 June held in Singapore. Accordingly, Eulji Freedom Guardian drill has postponed and South-North Korean military talk and discussion on inter-Korean railroad are taking place. It was hard to imagine making all these happen few months ago. Therefore, it is very important to use our imagination and get prepared to terminate 70 years of armistice and open a new peace era. On the other hand, politics and livelihood of the people are not getting better at all. People judged the Liberty Party with 6.13 Regional Election for having no reflection, no reform but rather interfering matters of the peace in Korean peninsula. Nevertheless, politicians are still fighting with each other and the National Assembly has stopped its functions and duties. 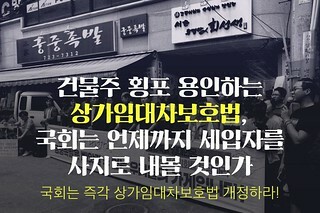 Influence peddling scandal of Judiciary during the term of a chief justice Yang Seung-tae has revealed. Comprehensive revision plan of real estate taxation doesn’t seem enough to solve severe property inequality and democratic economy measures for small-medium business and self-employees are not visualized. Meanwhile, leading and opposition parties have dealt with minimum wage legislation without listening to opinions worsening the conflict. As mentioned above, the degree of reforming politics, judiciary, social and economic fields, and government organizations are far less than expectations of citizens that people don’t feel the change. This June was the time to confirm that PSPD has piles of works to do. Last May, the Supreme Court ruled to disclose special activity expenditure of the National Assembly in respond to PSPD’s request made to a secretariat office of the National Assembly for disclosing related information from 2011 to 2013. However, the National Assembly keeps delaying it. PSPD is planning to analyze and present the result upon release of requested information as the National Assembly promised to do in early July. On the other hand, the secretariat office once more decided to refuse PSPD’s another request of information disclosure for special activity expenditure from 2014 to 30 April 2018. Since the Supreme Court said it is not subject to confidentiality, additional legal action will be taken into consideration regarding this matter. As shown by Noh Hoi-chan, a lawmaker of Justice Party who said to return all special activity benefits, there is no reason to pay it to heads of negotiation bodies every month so that PSPD urged to instantly abolish special activity budget being paid like salary or allowance. 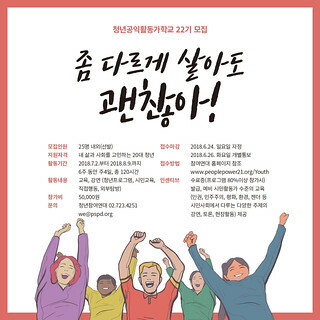 ‘Voter’s meeting to change my life with regional election’ were held in Chuncheon, Daegu and Seoul 2-3 times respectively before and after the Regional Election. In the meetings, people learned and discussed who seven elect-to-be were, their powers, evaluation of their promises, and rights and obligation of voters. One participant who joined in all three Daegu meetings said “I have learned that we have to watch politics more closely and what our voters’ rights and obligations are.” It was not a direct movement for ‘elect or no elect’ but provided precious experience to both the organizer of a new form of voters’ meeting and participants. Recently, a tenant who runs ‘Gungjung Trotters’ in Seochon where PSPD office is located has been arrested for assault and attempted murder of building owner who has demanded to terminate lease contract. This tragedy happened after the lessor demanded surged rental fee and filed for eviction suit, and twelve attempts of force evacuations. It clearly shows structural evil practice in our society which had allowed building owners to deprive the right to live of a tenant and result of dereliction of lawmaker’s duty. In order to prevent another case, it is required to revise the law which can truly protect building tenants by limiting the extent of rental fee raise and enhancing lease protection from five to ten years. PSPD has organized solidarity for the Commercial Building Lease Protection Act Revision and is preparing for enacting the revision at coming regular session of the National Assembly. [Card News] ‘What does Samba have to do with merger of Samsung C&T and Jeil Industry?’ was released early June. PSPD tried to help people to easily understand how allegation on window dressing accounting of Samsung Biologics is related to Samsung’s management succession to Lee Jae-yong. 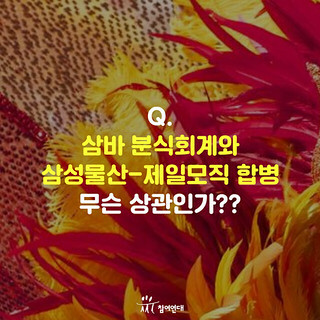 Q&A was published for the press release and a video clip was made and distributed in which Jeong Seong-in, a professor at Hongik University and Kim Kyung-yul, a president of the Economy and Finance Center of PSPD explained the case. PSPD is watching and monitoring Securities and Futures Commission under Financial Services Commission which hasn’t made a decision regarding the allegation yet. It will be closely watched so that it does not end with ‘Too generous to Samsung’ decision. Since the revised bill for minimum wage has passed the National Assembly last May, a voice to control the speed of increase rate has risen. 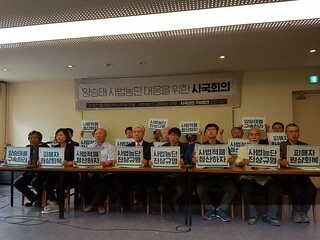 Hence, PSPD held a joint press conference to urge the government and the National Assembly to take a responsibility for aftermath measures, and present collected stance of organizations to proceed to minimum hourly wage of 10,00won. In response to a rapid change, PSPD held a roundtable <Assessing North Korea–US summit and following tasks> on 19 June consecutive from the last month. In particular, it sought roles of civil society to improve South-North Korea relations and confirmed that the most important matter is the faith not stronger military power or security expenditure. It also agreed that more discussions about the future of Korean peninsula are required and we need to use our imaginations for that. 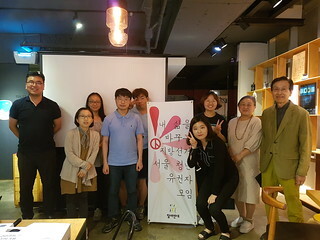 More than 80 national and foreign modern history experts and peace human rights advocates gathered in Jeju and held the third peace tour which first started in 2013. Representing various organizations, PSPD announced the stance and urged Moon Jae-in administration not to ignore Palestinian massacre in Israel as a member of international society since it abstained from ‘Resolution to protect Palestinian civilians’ at UN Security Council held on 13 June. When Duterte, the president of the Philippines visited Korea, PSPD announced a statement demanding to stop extra-judicial killings and oppression on Philippine civil society. In addition, it requested to reconsider supporting ‘Enhancing investigation capability of Philippine Police’ program provided by Korean Police Administration and KOICA. The Constitutional Court ruled on the last day of May that the Article ‘Prohibiting assembly and demonstration within 100 meters from the National Assembly’ does not accord with the Constitution. The decision was made in five years since Lee Tae-ho, a former secretary-general of PSPD was prosecuted for violation of Assembly and Demonstration Act when participated in a march to the National Assembly. Lawmakers are obligated to listen to voices of the people so that prohibiting rallies and demonstrations around the National Assembly where lawmakers are is against the spirit of the Constitution. Now, it is lawmaker’s turn to change related laws. This is not the only victory for the Public Interest Law Center of PSPD. KT users filed for a legal action demanding to disclose documents submitted by investigation agencies to KT requesting communication data. Recently, court ruled partly in favor. This lawsuit should provide an opportunity for communication service users to be aware of and control indiscriminate provision of users’ communication data to the police and investigation agencies. Faith in Judiciary has totally broken in shivers. 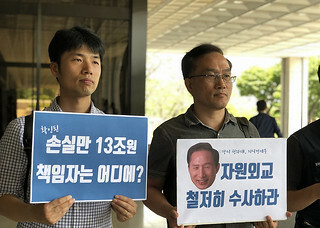 At the end of last May, the Supreme Court released the third investigation findings on allegations of monitoring judges and trading trials during Yang Seung-tae period. Some related documents were also disclosed and allegation on monitoring judges was turned out to be true. Documents revealed that Judiciary and the Blue House had tried to trade off establishment of final appellate court and some trials. In other word, the Supreme Court is not eligible for investigating itself and punishing the responsible so that prosecutors have to take over its baton. PSPD presented its stance to urge prosecutors to investigate Yang Seung-tae, a former chief justice and held a forum, discussion on current crisis, press conference and submitted a petition to UN in cooperation with Minbyun. 17 organizations have jointly organized a press conference and reported Yang on 5 June. Last January, PSPD and 1,080 citizens already reported Yang to prosecutor office in regard to surveillance on judges and attended at the first interview of reporters. It also took a legal action on 28 June demanding to disclose documents which courts have not released. Furthermore, it held a forum on current judiciary crisis and declared civil society joint action urging complete investigation and to find the truth. In respect to chief justice candidates who would replace a current chief due to retire in August, it proposed to recommend judges who can represent socially underprivileged and minority, reflect various social components and try to break a practice of appointing one with the office of court administration background. 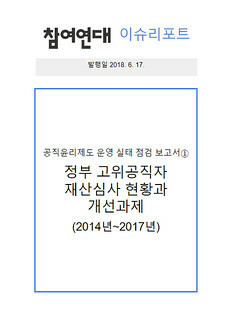 ‘People’s Council to find the truth of MB’s resource diplomacy’ in which PSPD participates has reported a former president Lee Myung-bak, the blue house of Lee administration and the responsibles at Ministry of Knowledge and Economy on 18 June concerning the acquisition of insolvent Harvest. The estimated loss of KNOC incurred by acquiring the Harvest reaches to 551.3 billion won. Lee and involved authorities who made speechless dereliction of duty have to be taken to courts and benefits earned from the crime have to be returned to the society. Recently, Special Committee for Financial Reform of the Blue House held a hearing and announced a revised measure of comprehensive property tax. In regard to this, PSPD expressed deep disappointment that measures are not good enough to ease severe property inequality and practical tax rate stays at 0.16% which is less than a half of OECD average. 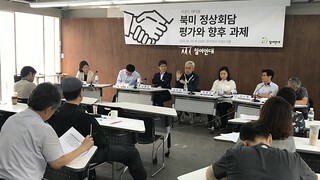 At the press conference on 28 June, PSPD urged the government to enhance real estate property tax and demanded to propose long-term vision and a roadmap to reduce inequality. The Center for Administrative Watch of PSPD has looked into registered property examination system for public officials in order to check if it functions to increase transparency of how properties and assets are acquired and restrain them from pursing private benefits, and has published findings in an issue report with suggestions. Public officials should not use secrets learned in the course of performing duties for building private assets. PSPD raised a problem that 92.4% of who are liable to register entrust it to registration agency that examination is not likely to be strict or fair. In fact, numbers of disciplinary actions taken by agencies are far less than public service ethics committees. Hence, PSPD suggested to enhance examination process for how assets are built and to reconsider the system of refusal to register. Furthermore, PSPD will examine Public Service Ethics Act in general such as restrictions on employment for retired public officials and review of relevance of duties by examination committee on blind trust of stocks, and publish findings. 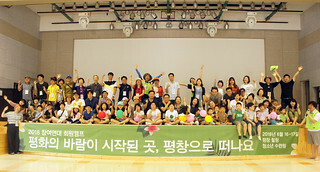 One night two days PSPD member’s camp was held on 16-17 June with more than 80 members at Pyeongchang where the wind of peace has started. Members went to Chiak Mountain, Guryong Temple, Geumgang pine tree flower road and played community games at Pyeongchang Healing Youth Training Center. With an instructor Choi Bo-gyeol who teaches at Academy Zelkova Tree, they awakened sensors of the body and learned the joy of expressing the selves through ‘Dance circle for city nomad’. A visit to Pyeongchang Farm Herbnara gave a chance to feel and enjoy scent of herb and various plants. We hope more members can join the camp and share brightness and laughter next year. Seochon yellow ribbon workshop opened in April 2016 to cherish the 2nd year of Sewol Ferry disaster and closed in three years in June 2018. Not only nationally but also from the U.S., Japan and Germany, orders for yellow ribbon have rushed but the supply was possible thanks to citizens who constantly volunteered. PSPD sincerely convey a gratitude to all who took a part in Yellow Ribbon Workshop, a PSPD’s flagship civil participating activity. In coming July, the Youth Public Activists School is going to commence. Young people who try to live differently will learn and talk about human rights, peace, environment, labor and gender equality, and also carry out campaigns.